I haven't come across a book investigating communication with aliens before, and it quickly became clear in the book that this is a neglected area of research which deserves study. After all, if one could establish patterns and similarities between various examples of alleged alien script sourced from UFO and psychic encounters down the years, then one could possibly make progress on understanding more about these mysterious visitors. It's clear that government agencies have considered how to respond to a communication from an alien civilisation. The author cites a declassified NSA document (1) describing such studies (p23), as well as cataloguing attempts by scientists to send meaningful messages to undiscovered alien civilisations out there (we're doing a great job of that every day - our planet is a noisy little backwater, beaming out a constant stream of drivel via various radio frequencies to anyone that cares to listen in). Nancy du Tertre has a strong academic background in law, and is clearly very capable of dealing with the rather dry research involved in comparative calligraphy. Her writing style is warm, almost breezy at times, which prevents the book becoming stale. But there is also an odd mix of serious enquiry and a regretfully ready acceptance of the downright whacky. For instance, the author includes a number of photos of perfectly ordinary people who are alleged to be aliens, with little supportive evidence for such an incredible claim. This seems overly credulous. Claims of contact with human-looking aliens from the hellish cauldron that is the planet Venus go unchallenged. And so on. In mitigation for the circus of weirdness eloquently paraded in these pages, the author argues that aliens may be giving us messages in formats we cannot begin to grasp, so we should be open to the concept of extreme weirdness when it comes to ET messaging. But why would they do that if they realise we would understand anyway? You wouldn't expect your dog to read a book, after all. The author argues that weird formats might include crop circles, for instance (p42). The only weirdness there are the personalities of the artists who carefully construct them, unfortunately. I've met a few of them. Communication comes in many guises. 90% of face-to-face human communication is non-verbal. In this respect, the Greys of abduction fame give little away. Their premium mode of communication appears to be telepathy, and the author offers some interesting insight into how this might actually work. When aliens do speak (demonstrating their surprisingly versatile alien larynx) they converse in a wide variety of human languages, to varying degrees of mastery. 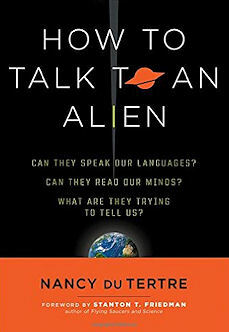 Accents and dialects are displayed, indicating either a well-travelled alien living among us (as the author seems to believe), or else varying expectations of alien abilities on behalf of the credulous experiencers. Nance du Tertre does allow for a degree of subjectivity and interpretation among those who report their encounters and observations, clouding the picture. She does not discriminate, however, between trained and untrained observers - giving equal weight to all. She describes the use of devices by aliens. Decades ago, these may have seemed all rather 'Star Trek', but with the advent of translation capabilities on mobile phones, etc, such devices seem quite reasonable to us now. So, the alien 'dialects' might be like the accent of the voice on your SatNav, and no great mystery. Clearly, to have electronic systems to translate so effectively, the aliens must have studied out various languages thoroughly over time - not difficult given our radio output, as indicated previously. The author is fascinated by psychic phenomenon, and has many good contacts in the 'remote viewing' community. She reveals interesting, well-sourced information about alien presence on Earth, as well as unguarded pronouncements by senior politicians. She deals with the subject of channelled communication very well. A family experience along these seems to be the motivating factor behind this book. The book then moves into an area which I personally found much more interesting - a comparison between alleged alien script and what the author called the 'angelic languages' of history. She demonstrates the long historic relationship between humans and supernatural beings of various kinds, drawing parallels between the scripts and alphabets which emerged from these historic encounters, and similar features of modern alien encounters. She undertakes a short study of these alien scripts, finding some common ground in the small sample she provides (p170), whilst seeming to recognise a broader lack of consistency across the range of material available. There are problems with even beginning to translate or interpret these alien letter/words/phrases, however, as the channellers themselves seem unable or unwilling to provide word-for-word translations of what they have been provided with. Much of it looks like random scrawl. No Rosetta Stone here, compounded by that lack of consistency and broad variation of script available for study. The author argues that there must be any number of alien languages for all the types of aliens reportedly visiting Earth, muddying the waters further. If a consistent body of 'alien' written material was to be available, I should think there would be no shortage of expert intelligence analysts eager to break the cyphers or code therein. They love a challenge. The problem is that there does not appear to be a strong candidate body of information available for study - at least, one in the public domain, anyway. So, perhaps it is asking too much to expect great progress on this by the author. What she does raise as a real issue, however, is the real need to address this problem. If a consistent message could be drawn from the available written material, then it would resonate powerfully with a great number of people. Nancy du Tertre is heading along the right lines, but has set herself a mountain to climb. Subtitled "Can They Speak Our Languages? Can They Read Our Minds? What are They Trying to Tell Us?"